Ron Stephens stood on the tarmac in Ottawa alongside NASA researchers, trying to pretend like he wasn’t nervous about boarding a test aircraft that would repeatedly climb high into the sky and then nosedive towards earth, creating the zero-gravity conditions he needed to test his space printer. The zero-gravity flight aboard the National Research Council Canada’s (NRC) Falcon 20 aircraft would determine if months of work in the lab were a success. 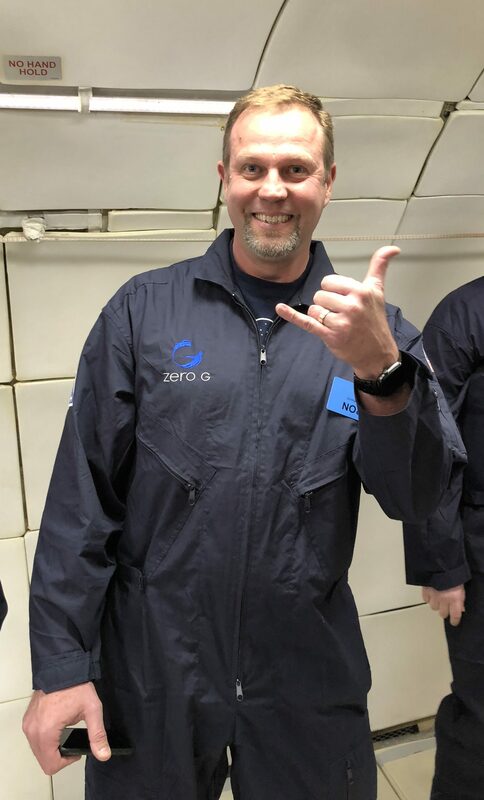 While Stephens and the team he manages in HP’s specialty printing systems group had accounted for all the requirements of building a printer for a zero-gravity environment on paper, this would be the first real test in real zero-gravity conditions. The Canadian research organization may at present be the only facilities in the world that could have provided that opportunity. Ron Stephens is ready to rock just before beginning zero-gravity aerial maneuvers on board a Zero-G leisure flight on Jan. 31. Thanks to the printer’s perfect performance during those aerial acrobats, Stephens won’t have to be as nervous on April 2 at 4:30 PM ET. If the winds are blowing just right in Cape Canaveral and all systems are a go, then the HP Envy Printer will be part of the 2,760 kg payload blasting into orbit aboard the SpaceX CRS-14 resupply mission to the International Space Station. Stephens and the rest of his R&D engineering team at HP will watch their be delivered in spectacular fashion as the massive Falcon 9 rockets fire to escape the strong force of Earth’s gravity. Since the Falcon 20 program began in 1994, this was the first time that it’s ever been used to test printers. Derek Gowanlock, a research flight test engineer with NRC, recalls the wide array of equipment tests that he’s helped facilitate – from rover wheels on Mars, to how surgery might be done while floating in space. Even a series of five zero-gravity flights studying how flames spread in micro-gravity situations – the fire safely contained in a series of glass tubes. The program has also been used to test other equipment before it’s sent to the International Space Station. So it was no problem to receive a shipment of four printers from HP and secure them to testbeds, preparing for three zero-gravity flights done over three days. “Everyone knows what an inkjet printer looks like, but getting it to work in zero-gravity is a real engineering feat,” Gowanlock says. Given that planes involved in zero-gravity research have been nicknamed as “the vomit comet,” Stephens was justified in having some nerves. Because of the parabola maneuvers necessary to create the zero-gravity environment, there are also portions where flight participants experience 2G, or twice the force of normal Earth gravity. That meant that crew had to set up print jobs and pull paper out of the tray while their bodies were being pressed into the floor of the aircraft. One challenge in testing the HP Envy printer was just timing when to press the “print” button, recalls Aaron Persad, a researcher with MIT that was hired by Integrated Space Flight Services to provide assistance with the NRC flight. Some of the test patterns the researchers wanted to print would require almost the entire 15 to 25 seconds of zero-gravity created at the apex of each parabola. Each flight included between 10-13 parabolas and zero-gravity windows to execute the tests in. At the end of it, the tests were executed and the printer performed its tests flawlessly. It was exactly the tests that HP needed to be sure its orbital deployment could proceed, and it only could have been provided by the Ottawa-based NRC crew. There aren’t many options available for researchers that want to conduct zero-gravity tests. Today Stephens is only aware of two providers of the parabolic flights that HP required for its testing – the NRC and Space Adventures subsidiary Zero Gravity Corp. (Zero-G). Parabolic flights were previously provided by NASA, as far back as the late 1950s. But NASA retired its KC-135A aircraft, known better as the original “Vomit Comet” by press, on Oct. 31, 2004 after a decade of reduced gravity missions and famously serving as a filming location for the 1995 film Apollo 13. Now NASA contracts out Zero G to provide its research flights, funded through its Strategic Capabilities and Assets Program. 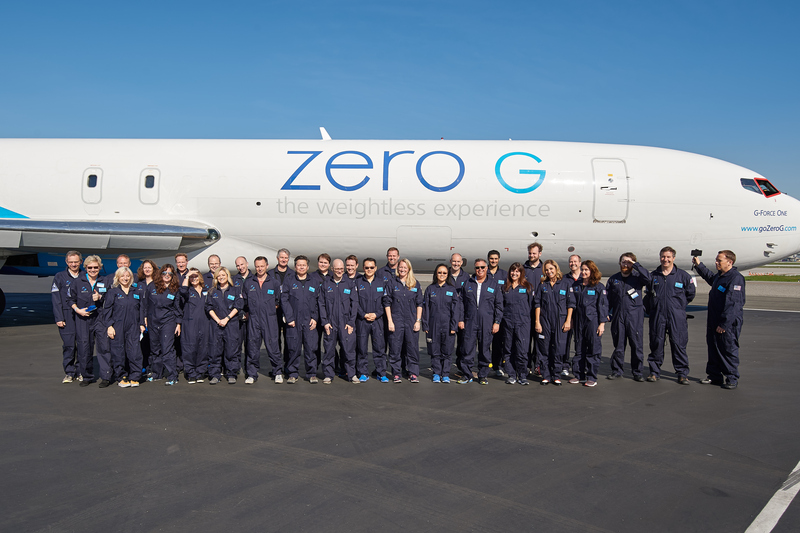 The Zero-G research program has catered to a long list of clients, from higher education, to the pharmaceutical industry, to aerospace firms. Its advantages for researchers are the flexible access, with even individual tickets available for research flights starting at $7,150 USD (commercial flights for fun cost $4,950 USD). Since the Weightless Lab is hosted in a converted Boeing 727 plane, there’s also ample space for researchers and test equipment. “ZERO-G’s research flights are the closest thing to conducting experiments in space without actually leaving Earth’s atmosphere. Research flights with ZERO-G deliver the longest duration of microgravity at a level matching NASA’s rigorous standards, making it the first choice for equipment and experiments destined for the International Space Station and beyond,” said Terese Brewster, CEO of Zero-G, in a statement emailed to IT World Canada. But according to some researchers, the NRC’s Falcon 20 program can more precisely simulate the microgravity as it’s experienced on the International Space Station. While the experience feels the same flying through parabolas on either aircraft, Persad explains that if you were to measure it with a gravimeter, you’d see that the Falcon20 flights produce an environment that is an order of magnitude closer to zero-gravity. HP’s Stephens says the Falcon 20 was able to provide the conditions required for their tests. “We worked with NASA to see, which of those companies would have the right capabilities to be able to manage zero g very closely. It’s challenging to maintain pure zero g in these flights. We were really looking for a group that was able to do that and had a proven record of doing that in testing,” he said. The NRC has heard from its clients that the microgravity environment it can produce is more pristine than other commercial providers. (Until it recently declared bankruptcy, Swiss Space Systems also offered zero-gravity flights in Europe.) Gowanlock attributes the reasons for this to the Falcon 20 aircraft, which was procured from the Department of Defense in 1992. Its wings are of a shape and stiffness that allows its straight arc through the sky to stay true. In the cockpit, pilots also have a pitch control that is more responsive than other heavier aircraft. “They can fly it more precisely,” he says. While flying the Falcon 20 through a parabola, the pilot keeps their eye on an analog zero-gravity monitor that displays movements across three axes – the pitch, roll, and yaw – and aim to fly a path that is within a couple of inches of the ideal path. It takes a high degree of pilot skill to achieve, Gowanlock says, with even Canada’s famous stunt pilot fleet, the Snowbirds, only requiring accuracy to flight paths that are within a couple of feet. Does that make the NRC’s Falcon 20 the best aircraft for zero-gravity research? Gowanlock modestly says that it’s the best for certain research requirements, but not others. For example, when NASA wanted to test its new muscular skeletal loading system – basically an exercise machine for space – it required more room than the Falcon 20 could provide. Still, being small provides its advantages. The NRC program can tailor its flights to the needs of researchers, doing as many as 45 consecutive parabolas on one flight – if the researchers have the stomach for it. There are also drop tower facilities for zero-gravity researchers located around the world. But these facilities can only provide one single 20-second window of zero-gravity, and only for smaller payloads. Plus, no humans could go along for the ride. Long before it ever tested the Envy printer onboard the Falcon 20, HP was prototyping components for it using its 3D printing technology. Its 3D print group developed a new nylon and glass bead material, which meant the components would be strong enough for production, not just testing. The HP Envy printer was adapted for the ISS using a special 3D printed material of nylon and glass beads. Using the 3D printing design allowed for a couple advantages. Early designs of the printer required many screws to hold pieces together, but those were eliminated by molding all the pieces into fewer integrated parts. Other types of plastic manufacturing, such as injection molding, wouldn’t allow for such precise details. The material also provides better durability than moving metal parts, which might bend after repeated use. Overcoming zero-gravity posed a couple of design challenges to the team. Earthlings using printers count on gravity to help capture the paper sheets as they come out of the inkjet, falling into a plastic tray. To compensate for the lack of gravity in space, HP designed the Envy with a special ‘tongue’ in the output tray that captures the paper as its ejected, trapping it out of the way of the following sheet. Another component was also needed to help create the proper spacing between the inkjet head and the paper. Otherwise, the Envy looks much like its less out-of-this-world inkjet counterpart in the Envy 5660 printer. They’ll likely be a welcome addition to the astronauts that have been using two Epson 800 inkjet printers – one on the U.S. side, the other on the Russian side – to print reams of materials for many years. 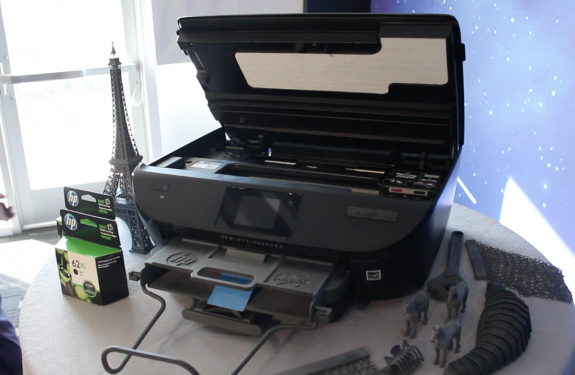 Eventually, 50 of the Envy printers will be aboard the International Space Station. On Jan. 31, Stephens had the chance to go on another zero-gravity flight. This one wouldn’t be for research, but for pleasure, with HP contracting Zero-G to take its top executives, the Envy engineering team, and some media (including IT World Canada) on a celebratory set of parabola arcs. This time, he didn’t feel so nervous. Just excited to experience the unique sensation of zero-gravity, even if for a brief time. For now he’ll have to be content watching as two HP Envy printers aboard the SpaceX CRS-14 resupply mission blast off from Cape Canaveral. Full disclosure: editor Brian Jackson’s Zero G flight and travel expenses were paid for by HP Inc. for the purposes of this reporting. HP did not review the story before publication.